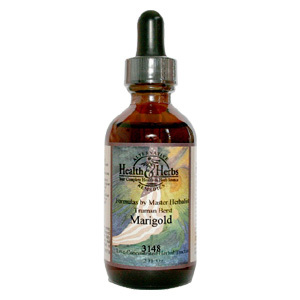 Marigold is an alterative, analgesic, anti-inflammatory, and antiseptic. For healing skin irritations and injuries, helps with conditions of the colon, stomach, liver, and gum disease. Use 6-12 drops in juice, water, under the tongue, or as desired. May be taken 3 times daily. Shake well. Store in cool, dark place. Keep out of reach of children. WARNING: Do not use while pregnant. Marigold, R/O Water, 12-24% Alcohol. Marigold is shipped in a discrete, unmarked package. Orders are processed immediately and usually take about 3 to 5 working days to be received. Any information received is used only for order processing and shipping purposes. Your information, such as e-mail address, will never be disclosed to a third party.